Delivered to your desktop, tablet, phone and inbox. MBSQuoteline delivers real-time mortgage backed securities prices live, right as trades happen. Get up-to-the-minute mortgage market news and analysis as events occur, and ongoing mortgage rate trends, all sent straight to your computer, mobile device, tablet or email. Our Economic Calendar keeps you on top of current economic releases. Stay plugged in, in real time, to mortgage rates and MBS trading updates, know in advance when investors will reprice, make the right lock/float decisions, impress customers and earn more referrals. Get streaming, real-time Fannie Mae (FNMA), Ginnie Mae (GNMA), and Freddie Mac (FHLMC) mortgage backed securities pricing. Mortgage originator tools don’t have to break the bank; get the same real time MBS prices professional traders and your investors use at a fraction of the cost. Get alerts before your investors re-price! Along with up-to-the-minute MBS prices, get mortgage backed securities news, top stories and concise, incisive MBS commentary by experienced analysts throughout the day, as it occurs. See real-time Treasury prices, including change for the day and yields, all on your desktop or mobile device. Customize charts for 1 day to 5 year time frames. MBSQuoteline puts you just a click away from charting the history and trends of MBS prices, mortgage rates, treasuries, ARM indexes and economic reports. Customize time frames and compare charts. Expanded coverage of the markets gives your secondary markets team Ginnie Mae II (GNII) pricing PLUS off coupons and two forward months’ prices. All the risk management tools you need at a fraction of the cost. Take advantage of expanded pricing for actively traded mortgage backed securities on the same screens traders use. See 30-year, 20-year, and 15-year prices for FNMA, GNMA and FHLMC. Track current coupons, off coupons and forwards in real time. 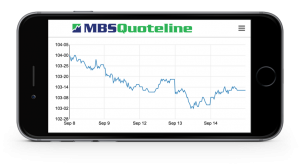 With MBSQuoteline, you can chart MBS prices over time, intra-day or inter-day up to five years, add moving averages, candlesticks, stochastics, and more. You get many valuable mortgage originator marketing tools, including a personalized weekly newsletter to send to clients and referral sources, and to post on social media sites. Be the expert your clients expect with the most accurate information on the mortgage backed security market, and know what’s moving interest rates today, tomorrow and beyond. See more. “I find your reports invaluable to my perceived expertise by my clients! You make me look smart! “Your analysis on the G-Fee impact and the caution about lock extensions was great customer service. Thanks! “I find MBSQuoteline to be an effective way to stay abreast of the market with minimal cost. it’s proved to be a great tool for referral business. I would recommend MBSQuoteline to anyone that wanted to get an up to the minute MBS market watch that won’t break the bank. “I had been testing MBSQuoteline for about 4-6 weeks when I decided to cancel my other MBS subscription. I have found that the MBSQuoteline service provides more concise secondary marketing information without a lot of the fluff that the other service was pushing. It is strictly pricing information with impressive charting options and instant updates throughout the day based on market movement. I would recommend it to any loan officer and in my opinion is superior to the information, advice, and options that the competitor provides. “I was a bit nervous when switching systems. I have used another service for 10 years. But I must say, knowing that alerts will come to my e-mail with a good explanation of what is occurring in the market relieves me so much. Before, I was staring at the charts all day long, distracting me from my work. Now I can sit back, relax and know that MBSQuoteline will watch the market and let me know what I need to know when I need to know it. “I use the newsletter MBSQuoteline produces for me and distribute it to my database of personal and business contacts – approx. 600 per week. I average 2-3 leads a week based on this. “MBSQuoteline has a very valuable service for mortgage professionals. If you’re a mortgage professional, you truly should be a subscriber. “I just can’t say enough about your program. In addition to the market updates that I receive, your company provides the educational info that I need to grow my business. Your program blows away your competitor. I have never received such great personalized service and will refer your company to everyone I know. “I absolutely love MBSQuoteline. I am using the site, alerts and newsletter. I am watching the site all day. What I love most is that after 10 years in banking, 7 of it being specifically in mortgage, I am finally learning how all the pricing and markets affect mortgage rates. Before I had been told to just watch the 10-year treasury, and it’s never been enough for me. “This service has saved many of my deals in the 30 days I’ve subscribed. Plus it’s relieved me of much stress with proactive messages and relevant content sent throughout the day. Streaming Real-Time MBS and Treasury Prices, News and Analysis, Re-Pricing Alerts, PERSONALIZED Weekly Newsletter, Mobility and Flexibility, Custom Charts, and much more!